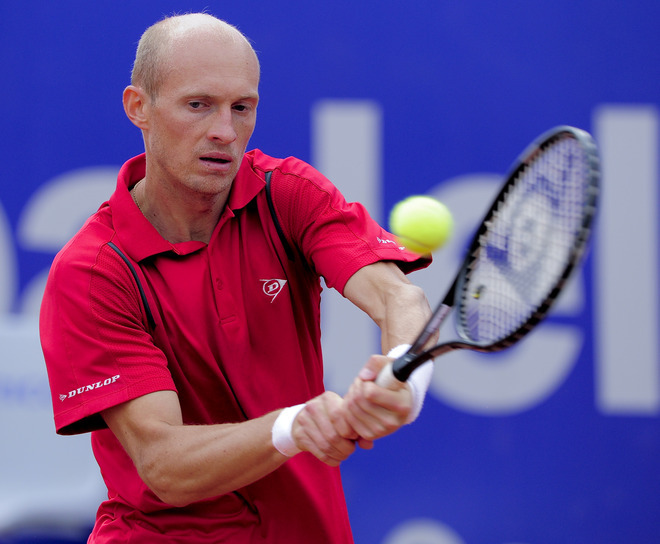 Madrid: At the Mutua Madrid Open this week, Davydenko starts with a match against wildcard Marcel Granollers. They play tomorrow. Browse:Madrid Open website. Buy: This red polo’s not for sale on the Dunlop site, but you can check out the rest of the goods here. 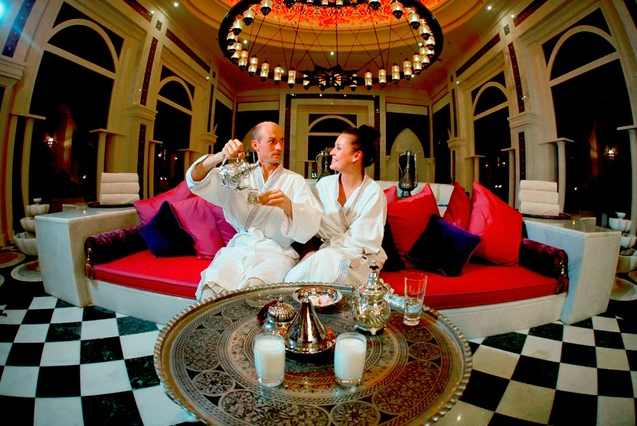 Nikolay Davydenko said nothing of importance this week, but that certainly didn’t stop us from running this brilliant picture of him and his wife Irina at the Jumeirah Zabeel Saray a resort and spa located in Dubai. It wasn’t good news leading up to the Acapulco event this last week in Mexico, after 13 people were killed by gun violence. 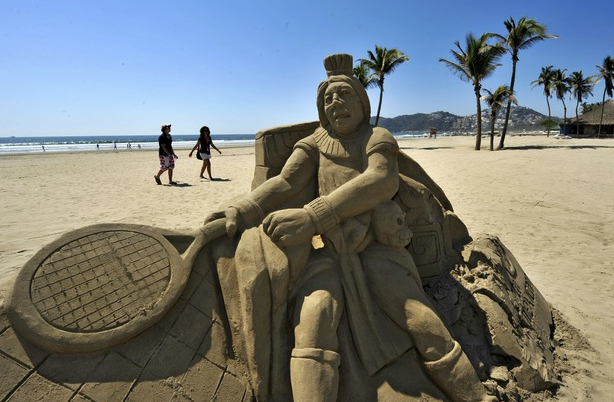 The ATP and WTA event has gone off without a hitch, however, after the ATP released this statement earlier in the week explaining their decision to keep the tourney as is: “Following an independent security assessment and discussions with tournament organizers, we are satisfied that responsible measures are being taken, and that the event has the full support of the authorities of Acapulco, the state of Guerrero, and the Mexican federal government.” Above: some sand art on the beach that we’re definitely digging. Since we’re done with our fashion coverage for the year (we only kid! ), we decided to look a little bit closer at the tennis that will be played at the upcoming Australian Open, which begins Sunday night on American television. 1. No one can come into the AO feeling better than Roger Federer. The Swiss Mister won his season-opening foray in Doha without dropping a set, beating Nicolay Davydenko in the final. Along with his win at the World Tour Finals, Federer has notched 10 straight matches. 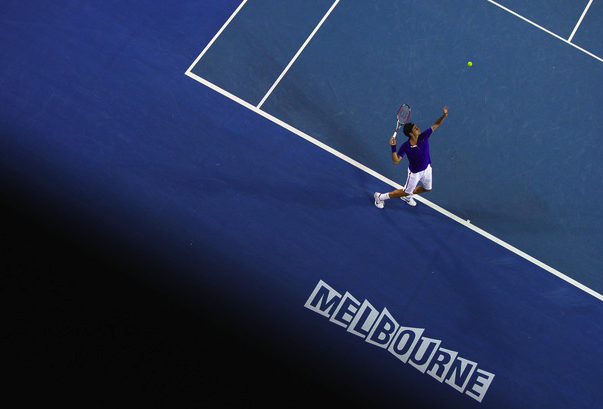 Federer played three exhibitions during the off season – all against Rafael Nadal – and looks primed to defend his title in Melbourne. 2. Serena Williams. It might be strange to see Serena’s name second on this list, but the current world no. 4 will be the biggest female force in this year’s draw – absent force, that is. The defending champion hasn’t played a match since winning Wimbledon, and the ladies look lost without her. Serena beat Justine Henin in the most memorable Slam final of last year here, and the sticky courts of Australia won’t have the same female ferocity without her. 3. Rafael Nadal is appropriately third on our list – especially seeing that he has won three straight Slams. And there are three factors that play into Rafa winning an illustrious, fourth straight Major: his health (most namely his knees); his focus against lurking dark-horses (there are plenty – check back tomorrow); and his ability to rise against the Roger challenge. He failed in two of those in losing soundly to Federer in London in November, but will look to build his confidence one match at a time at the AO. 4. There is hard to find a more like-able – or more important, match-savvy – player on the WTA right now than Kim Clijsters. Clijsters captured the US Open for the second straight year in 2010, and then went on to dominate the women’s season-ending event. Her loss in Sydney’s final on Saturday to Li Na? We say that’s a good thing: A more-focused Kimmie won’t produce any 6-0, 6-1 third-round catastrophes this year. 7. While Tomas Berdych continues to be a mystery since his French-Wimbledon brilliance (he’s 12-13 since July), Nikolay Davydenko and Jo-Wilfried Tsonga have made their own noise to start 2011: Davydenko took out Nadal in Doha and Tsonga fell to Roger at the same tourney. Tsonga is a former finalist here (downing Fed in the semis in ’08), while Davydenko has (shockingly) still not been to the last two of a major. Any of these three could fit in with our group at No. 5, but do they have what it takes to run seven matches straight? 8. 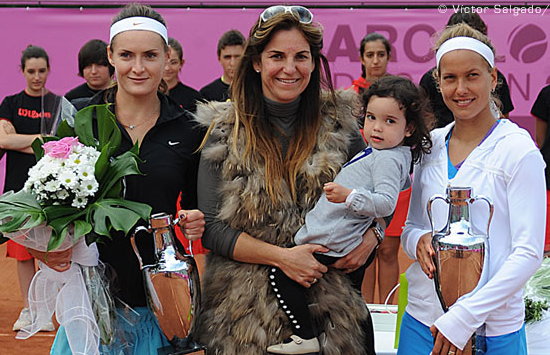 Here’s a new trio for you folks: Jelena Jankovic, Ana Ivanovic and … Bojana Jovanovski. While we could have included Janko Tipsarevic in this line-up, but this new ladies three-some is sure to have the eyes of some WTA followers over the next two weeks. Our guess: the three gals will chalk up 7 total wins (AI 4, BJ 1 and JJ 2) over the two weeks. The ultimate question? Who will have the best year of the bunch? Jelena is a dismal 9-13 since a French open semis run and Jovanovski beat Kanepi, Pannetta and Rezai last week alone. And another new coach for Ana… | Ana just wants to have fun? 9. Venus Williams didn’t win a set in two round-robin matches last weekend in Hong Kong. She hasn’t played a WTA match since the US Open. And before that? Wimbledon. It’s anybody’s guess for Family Williams in Melbourne this year. 10. Three ladies who have a solid shot at a week-two run and a decent chance of a first-round crash out include Caroline Wozniacki, Vera Zvonareva and Maria Sharapova. Wozniacki won just one game in an exo with Zvonareva last weekend, and both had bizarre early losses in Sydney. Sharapova’s ’11 debut? A second-round crash against Greta Arn. Just another (four) reasons that this might be Kim Clijsters’ Aussie to win. Draw: As the fourth seed at this week’s China Open in Beijing, Davydenko beat Cilic for that 400th win and will face Isner in the quarters. See the rest of the match-ups here. Crew: For Beijing, Dunlop switches from the white/blue 2010 US Open polo to this bright blue crew, a shade that works well to give Davydenko’s anemic features some pop. (And earlier in the North American summer, there was a blue polo but had a white right sleeve.) For now, the kits are still not for sale as far as we know. Tucked away in one of those pics of Roger and Rafa‘s creating paintball art — designed to fete the upcoming ATP year-end tournament in London — was this one of Nikolay Davydenko‘s piece. And since the artwork’s stencils were based on each player’s signature move, we couldn’t help but wonder: does Kolya really look like a lanky kokopelli when he serves? Yikes. Oh well, it doesn’t matter; a man who serves us tequila can do no wrong. 2010 US Open Nikolay Davydenko ran into that gorgeous backhand of Richard Gasquet and fell in straight sets. Nothing to write home about re: his Dunlop kit, and even now that he’s officially a face for that company’s new line of Biomimetic racquet’s, he played through two rounds in Flushing Meadows with an unstenciled Prince. In that first photo, the crew; in this one, the polo. His wife, Irina, hanging out on the practice court while Kolya did his thang. Kolya served us a tequila shot (his second favorite drink) at last night’s Dunlop party at the Union Square Ballroom. He would’ve made us a vodka and Red Bull (his favorite), but the bar didn’t have the mixer. Dunlop‘s unwrapped the bandages after a recent facelift of their website, which had been out of commission for a few months starting around Indian Wells time. It’s the usual fare for companies like this: player/product info, press releases, etc. There’s a page of wallpapers on there, too. 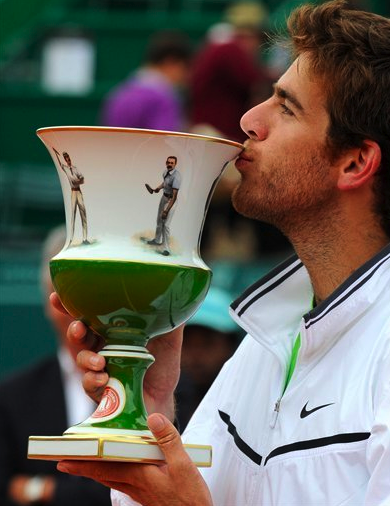 Sadly, they went with some so-so photos of the usually photogenic Jurgen Melzer, Tommy Robredo, and Ross Hutchins. And speaking of Dunlop, their most recently acquired mascot, Kolya Davydenko, still appears on rival Prince‘s roster of players. And another one of Dunlop’s sponsorship issues was covered by CNBC’s Darren Rovell, who discussed 2010 Wimbledon finalist Tomas Berdych‘s racquet ruckus, using Head sticks even though he’s paid to play with Dunlops. 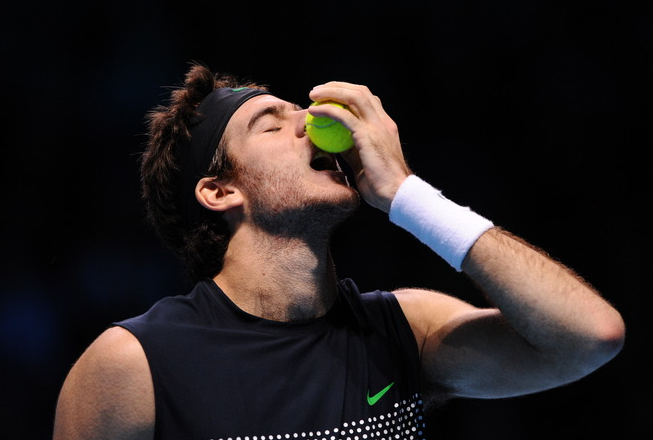 Top clothing marks go to Leonardo Mayer in Lotto. Everyone else came predictably dressed (Eduardo Schwank in Topper‘s standard issue; Nalbandian in Yonex; Davydenko — with costume changes — in Dunlop; Kunitsyn and Youzhny in Fila and adidas whites, respectively). Click on the pics below to see more. Wanting what we can’t have: That sleek red Dunlop polo worn by Nikolay Davydenko at the 2010 BNP Paribas Open (last week) is purely for show; while there are other Dunlop tennis clothes available for sale in the U.S., the ones on Nikolay are from the European collection. 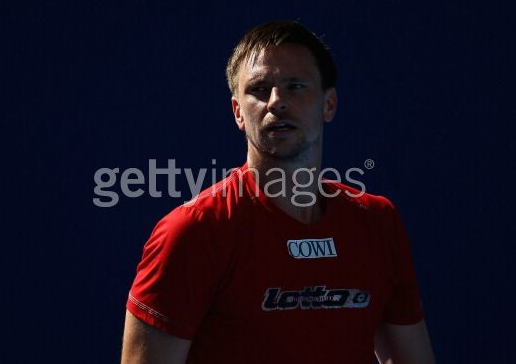 The top Russian’s sponsorship deal with Dunlop was announced just before the start of Indian Wells. Especially in light of being in limbo with Prince, we were happy that Nikolay had monetized his achievements in some form for 2010. Now you see it…: The deets of the agreement came in a press release via the Dunlop and ATP sites. Along with endorsing racquets, clothing, and accessories, Kolya would also speak up for the company’s junior talent identification program, called D-Squad. Two days after the Dunlop announcement, Prince countered with their own releases stating that Kolya had signed a deal to be “an exclusive endorsee of Prince tennis racquets and Prince racquet bags” through 2010. This requires him to have a Prince stencil on his Ozone Tour rackets during the four slams. Off the court, there’s also a clause giving Prince the right to use the Davydenko image for advertising. 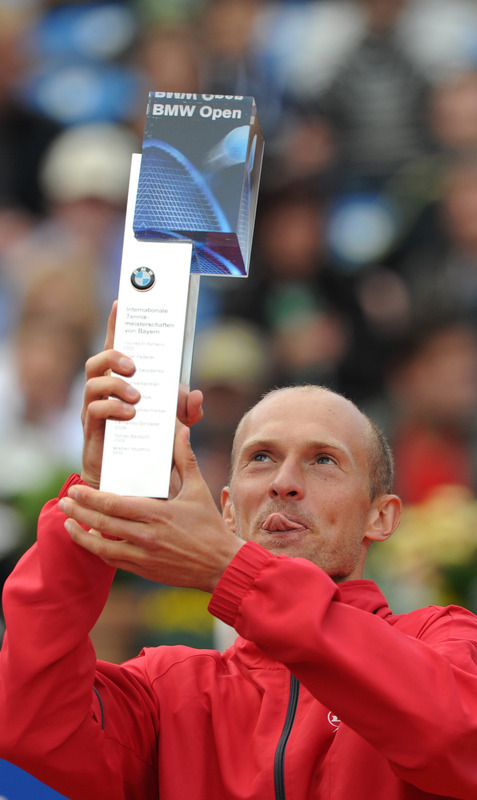 So both companies are sticking to their guns, but it doesn’t matter since Davydenko pulled out of Indian Wells. He felt pain in his wrist while playing Rotterdam in February (he lost in the semis to Soderling) but it was misdiagnosed. He continued playing through the injury until he got to the desert; after a hard-fought win over Ernests Gulbis in the second round, Kolya discovered a more serious condition — a broken wrist bone — and pulled out. Now you don’t…: The Dunlop press release, along with the rest of the Dunlop site, is currently down because of a revamp. The Dunlop release is also no longer available via the ATP website. I wonder if this is any indication of which company successfully courted Kolya? Blank slate: Nikolay has yet to test out any Dunlop racquets (he was using an unstenciled Prince stick during Indian Wells). And since he’s out for a few months — he’ll likely miss all of the clay season — it’ll be a while before he gets matched up with a Dunlop racquet (if at all). In a charming display of devotion to his wife, Nikolay Davydenko didn’t give up the goods when asked if there’s any Russian tennis player he would want to marry. “Man or woman?”, he wanted to clarify, before explaining that he already has a “beautiful wife”. Good for him, since Irina was in the press room at the time. We know how Kolya he likes his guys (nice eyes, nice hair), so in case those reporters are still wondering: we’re thinking he’ll pick Igor Andreev. Another fun Davydenko fact: he’s weak sauce. “I don’t drink so much because, you see, I’m skinny. I mix only, sometimes I drink clear vodka, sometimes mixed with Red Bull to give me a little boost in night club or disco. Status quo: No new drops from Kolya’s clothing sponsor, Airness. As expected, Juan Monaco — the 30th seed at the 2010 Australian Open — rolled over for his third round opponent, Nikolay Davydenko. The score: 0-6, 3-6, 4-6. To Juan’s credit, he had some pretty good wins in the prior two rounds, including one over Ernests Gulbis 6-3, 7-6 (7-5), 6-1 in the first and a five-setter over Michael Llodra in the second (Pico came from two sets down). It means go: Monaco’s wearing clothes from adidas‘s Spring 2010 Edge line, which is using green (“signal” and “dark”) as the contrast to the blue courts of the Australian Open. We’re all about the color blocking on the bermuda shorts, and pairing that with the intense graphic of the black/green crew gives a nice effect. Unfortunately, it just looks messy with the white/green colorway. Buy: adidas Spring 2010 Edge Crew, $55; Edge Bermuda, $55; Warm-up, $80. sunday survey: who’s it gunna be?! Is that tongue?! Has the ATP joined forces with MAP for our London Balls idea?! We mean, it is the end of the season, so you can’t really blame us for wishful thinking, right? Novak Djokovic took down Nikolay Davydenko 7-5 in the third set in their round robin encounter on Tuesday in London. The two have now met five times, with Djoko holding a 3-2 edge in the series. It wasn’t Bec Cartwright, Xisca Perello, Jelena Ristic, Mirka Federer, or Kim Sears cheering in the players’ box this week in Shanghai. Instead, it was Irina Davydenko‘s turn to fill airtime between points at the Shanghai ATP Masters tournament. The cameras would normally focus on the fans in the stands, but no one’s been showing up to the fill the cavernous, 15,000-seat Qizhong Stadium. Thankfully, the bejeweled Irina was up to the task, even occasionally staring up at the jumbotron and smiling when her mug’s been enlarged for the entire arena’s viewing consumption. One last shift: her husband, Nikolay Davydenko, will be playing for the Shanghai singles title tomorrow against Rafael Nadal. We knew it was a cross hiding under that adidas shirt, but we just weren’t sure what it looked like. Thanks for playing: The Serb, seeded second at this week’s Shanghai ATP Masters tournament, lost in the semis to Nikolay Davydenko 4-6, 6-4, 7-6 (1). Nole looked on track to beat the Russian, saving three break points in the first set and converting the second break point on Kolya’s serve. Davydenko broke in the second, using his speed to set up forehand and backhand winners from the baseline (but he showed some good net play, too). And by the time it got to the third set tiebreak, Kolya raced to 5-0 before ceding a point to Djokovic. He’ll face Nadal in the finals.